Nick Haughton has spoken of his delight at playing regular football for his new club AFC Fylde. The former Fleetwood Town man signed for Fylde’s National League promotion rivals Salford City in January of this year, putting pen to paper on a two-and-a-half year deal. But he struggled for game time, making just eight appearances this season – most of them coming off the bench – before making the move to Mill Farm at the end of October. He has since been a regular starter for the Coasters, playing seven times, although the midfielder is yet to find the back of the net. “I’m happy that I’m back playing football regularly,” Haughton (pictured) said. “I had a difficult time at Salford where I wasn’t playing much. “I’m glad Challi (Coasters’ manager Dave Challinor) has brought me in and given me the chance to show what I can do. “I’m helping the team as much as I can, I just need to get off the mark with a goal. I am trying though! Despite not scoring, Haughton – an attacking midfielder – has still been having an impact on recent games. 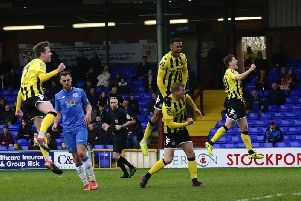 He set up Danny Rowe for his goal in Fylde’s 2-1 win at Hartlepool United last week, before bagging another assist, this time for Gime Toure, in Saturday’s 2-2 drawwith Sutton United. Despite taking the lead twice, Dave Challinor’s men were pegged back on both occasions to deny them a third straight win. But Fylde, who make the long trip on Saturday to face Dover Athletic, who are second-bottom but have picked up with three wins and a draw in their last five outings. “I think we played well (against Sutton) but sometimes, when you concede late on in a draw, it feels more like a defeat,” Haughton added. “That’s what the lads felt like at the end coming into the changing room. But we’ll take seven points in a week and we’ll head to Dover on Saturday. “They’ve obviously been picking up a good couple of results in the last few weeks. Fylde forward Ashley Hemmings has joined Vanarama National League North side Altrincham on loan until January 14. A summer signing from Salford City, Hemmings has made 17 Fylde appearances, 14 as a substitute.